Oh noo the windangle changed tight!?! With 1 speedset you can't be the fastest @ 110 degrees and 150 degrees. For every 5-10 degrees you have to change gear for the ultimate performance. The easiest part to change is the fin. You could take a little bit smaller fin for a 'sudden' tighter course. Also a bit more outhaul tensions helps. What if you know the course will be tight? The most important is a small board, on tight course smaller = better. 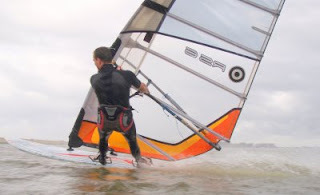 Pro's like Peter Volwater are using a Missile XS (with tectonics falcon 26-27cm) from 18kn with tight angles, but even if you're less skilled just take as small as you can handle!!! I prefer to use quite a big fin with a really small board (carbon art speed 44 + Select S07 25cm), maximize power&acceleration = speed. However if you want to start the easy way you have to take a bit shorter fin. For my CA speed 44 the safe choise would be 23cm or for my CA speed 50 a 27cm. If you are have to sail a full 500m course you'll need a big sail. I am using on tight course a 6.7 till 20kn, but my focus is on 10sec runs. If I have to go for a official 500m race I will sail my 6.7 till 25-30kn just to have a bit higher average speed. On tight courses (in real world) almost all speedworldcup pro's use the Tactonics falcon f1, just take my word. I know my select fins are always as fast or faster. Still tectonics force the rider to maintain the right stance, some speedsurfers are really sensitive and will go 5-8kn faster with a tectonics falcon f1 compared to all other fins. 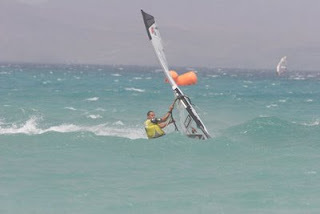 I would recommend every serious speedsurfer to try the tectonics falcon f1, for some riders it is magic, for me it was magic 2 years ago, improved my speeds 8 knots. However the select S07 M fins beat those tectonics records again... But I did learn something usefull with tectonics. Oh noo swell/chop or other bumps?!? This is quite a difficult one, on spots like gruissan you see some swell, on the North Sea you have sail between waves (also forced to sail tight). When water becomes a bigger mess you have to make you gear safe.